As Sainsbury's eyes a potential advertising agency review, Campaign rounds up the most notable ads created by its long-time incumbent, Abbott Mead Vickers BBDO. Celebrities including Dawn French, Selina Scott, Catherine Zeta-Jones and Dennis Healey were shown making their favourite dishes from Sainsbury’s ingredients. The campaign was so successful that Sainsbury’s often sold out of items featured in the ads. Sainsbury’s admitted its campaign starring John Cleese was a flop. The spot, which featured a garishly-dressed Cleese marching around the store and shouting about the benefits of Sainsbury’s "low-price guarantee" offer, alienated both staff and customers and was voted the most irritating ad of the year. Sainsbury’s signed Jamie Oliver in 2000 to front its revamped TV advertising after the account moved back to AMV BBDO from M&C Saatchi. The ads, which showed the celebrity chef whipping up tasty dishes for friends from ingredients he bought from Sainsbury’s, proved hugely successful. The retailer introduced its "Try something new today" positioning in 2005. Amid speculation that Sainsbury’s would part with its chef ambassador, the comedy duo joined Oliver for its Christmas ad. Sainsbury’s relaunched its Taste the Difference range with Oliver. Sainsbury’s decided to split with Oliver in 2011. 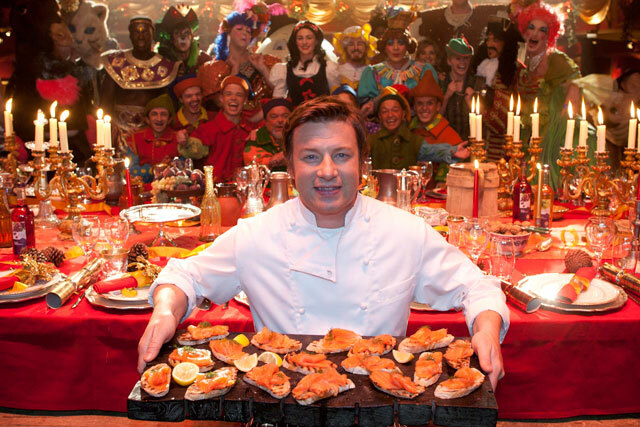 In his last ad as the face of the brand, Oliver cooked Christmas dinner for a full pantomime cast including Snow White and the Seven Dwarfs, Captain Hook and Cinderella’s Ugly Sisters. David Beckham starred in an ad to highlight Sainsbury’s sponsorship of the Paralympic Games. Sainsbury’s released a Halloween ad in its 'Live Well for Less' campaign, which showed children dressed in costumes lining up to be inspected by a little witch who tells them to show her "scary". The director Kevin Macdonald asked families across the country to document their Christmas for a 50-minute film released on YouTube. TV ads were created from the footage, showcasing the best bits and characters. Sainsbury’s promoted its partnership with The Royal British Legion by retelling the story of the legendary Christmas football match between German and British forces in World War I. The ad divided public opinion, with some asking whether it trampled on sacred memories, and the Advertising Standards Authority received more than 700 complaints about it. Sainsbury’s resurrected Mog, the cat from the children’s book series by Judith Kerr, for its most recent Christmas ad. The supermarket later praised the ad’s success for helping it perform well during the festive period.